Wargames had been popular for many years before Gygax invented D&D. This illustration shows the author H.G. Wells playing a wargame in 1913. Image via Wikimedia Commons. In the late 1960s, Gary Gygax of Lake Geneva, WI fell in love with the board game Wargames. Wargames simulated actual battles from historic wars, but offered players the opportunity to carry out campaigns in new ways based on rolls of a six-sided die. Gygax would spend hours on nights and weekends creating tabletop battles based upon real wars, moving players with carefully measured increments. Inspired by the game, but with ideas for improvement, Gygax decided he would create his own version of Wargames. In this new version, Gygax avoided what he saw as the ‘flawed’ six-sided die. Instead, in his game players draw a white poker chip out of a bag of twenty. This ensured the numbers generated were more random than a six-sided die. Gygax’s plan to use poker chips changed shortly after when he discovered a 20-sided die in a school supply catalogue. Gary Gygex in 1999. Image via Wikimedia Commons. In 1968 Gygax rented the Horticultural Hall in Lake Geneva, for the ‘second’/first official gathering of a group he called “Gen Con.” Gen Con is now a gamers convention that draws over 60,000 people, however in 1968, Gygax could only draw 20 people to the first gathering. Gygax charged a $1.00 admission fee, and made just enough money to pay himself back for the rental fee for the hall. Gen Con was enough of a success that Gygax decided to hold another the next year, and at the 1969 at the convention he met Dave Arneson, a game designer and the future co-creator of D &D.
While hosting Gen Cons expanded the group of people playing his games, Gygax continued to experiment with interactive game design. In 1971 he created his a new game called Chainmail. This one incorporated magic, and was played based on sixteen pages of rules! Gygax sold 100 games a month, at $3.00 a set. Although Gygax thought of his games as improvements to his first love, Wargames, enthusiasts of Wargames were disappointed in the new game and disapproved of the use of magic. Over the next few years Gygax and Arneson exchanged ideas and began expanding a game that was to be a variant of Chainmail. Soon they had invented Dungeons and Dragons. After being turned down by a wargame publisher, Gygax and a childhood friend formed a company in 1973 to market the game Gygax and Arneson had invented. That company was called ‘Tactical Studies Rules (TRS).’ The two friends printed 1000 copies of Dungeons and Dragons: Rules for Fantastic Medieval Wargame Campaigns Playable with Paper and Pencil and Miniature Figures. Gygax ran the company out of his basement in Lake Geneva and relied on word of mouth to sell his new game. Within ten months the 1000 rulebooks had sold out. An excerpt of an early review of D&D in The Courier. Original here. 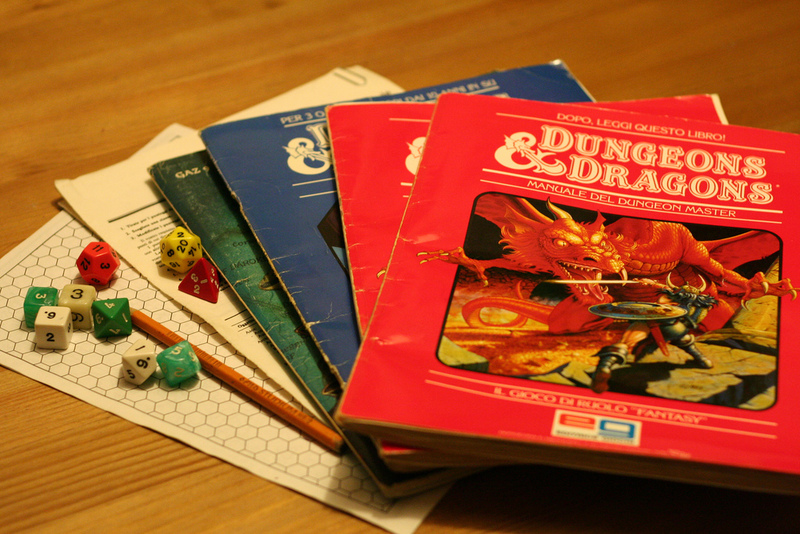 The game Gygax and Arneson invented continued with immense popularity into the 80’s. During that time, however, the game began to change in ways that Gygax did not support. Gygax sold the last of his shares at TSR in 1985. Gary Gygax died in 2008 in Lake Geneva. Duke, Galen. Dungeons & Dragons: 40 Years of a Wisconsin Invention, Wisconsin Public Radio, 20 Jan. 2014, https://www.wpr.org/dungeons-dragons-40-years-wisconsin-invention. Accessed 21 Dec. 2017. Kusher, David. Dungeon Master: The Life and Legacy of Gary Gygax, Wired, 10 Mar. 2008, https://www.wired.com/2008/03/dungeon-master-life-legacy-gary-gygax/. Accessed 21 Dec. 2017. Morrisy, Anne. Dungeons & Dragons: A Journey of Imaginations, At the Lake, Geneva Lakes Area Magazine, 25 Nov. 2014, atthelakemagazine.com/dungeons-dragons/. Accessed 21 Dec. 2017. Featured image: courtesy of Flickr.